CIP-Serial is a TDM over IP gateway that creates a Pseudowire connection throughout an Ethernet / IP network aimed at emulating a synchronous data link with very low latency and total transparency to data stream structure. A couple of CIP-Serial products establish a point to point connection over the Ethernet / IP network. It emulates synchronous modem communications and it enables synchronous application migration to an IP / Ethernet network. CIP-Serial delivers Nx 64 kbps connection speeds from 64 kbps to 4.032 Mbps. Clock can be simple or codirectional, and generated by either the local or remote terminal, or internal to emulate synchronous modem operation. 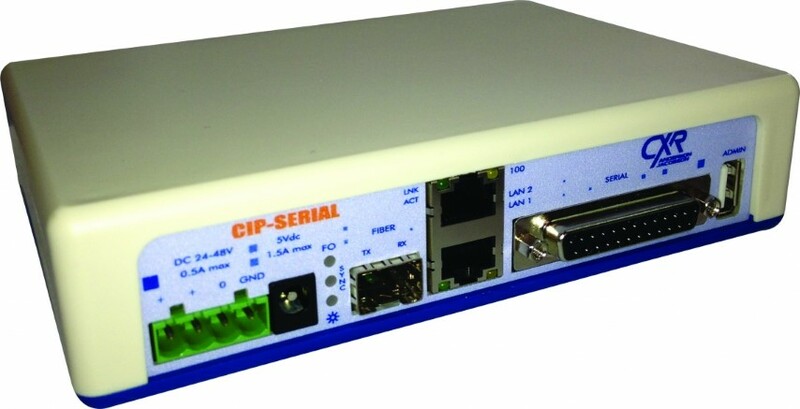 CIP-Serial delivers an RS530 / DB25 interface that may be set for V35, V36, X21 or RS232 mode. It embeds a Fast Ethernet switch with two RJ45 and one optical SFP ports. The Pseudowire circuit may be secured by Ethernet Trunking. The Ethernet switch enables controls of QoS, VLAN and Provider VLAN. CIP-Serial excels in its intuitive Web management interface and functions that anticipate network resource reservation and Quality of Service control. Its USB port can achieve automatic configuration backup and upgrades from a memory card. CIP-Serial is offered with a choice of 110-230 Vac or 24-48 Vdc power input. RS530, V35, X21 or V36 cable is provided with the product.